Once upon a time, we were all utility cyclists, and all of our rides could be adventures. Riding our bikes was how we got to school or the library, how we explored new neighborhoods and found independence. Riding half a block or half a mile was nothing. But somewhere between junior high and college bikes became uncool. We stopped riding our bikes and started getting rides from friends and parents in their cars and vans. Biking became a sport around the same time we got a car of our own. It wasn’t something that we needed to do, but rather something that we chose to do. Biking was a tribe that we belonged to. We kitted up and bought into a uniform of lycra shorts and clip-cloppy shoes. We went out for group rides, kept a tight pace line, and started reading Bicycling Magazine in the bathroom. We obsessed about training, and shaved everything. Our cars were ornamented with bike racks and oval stickers, MS150, TdC, PBP. We sipped Gatorade, gnawed Clif Bars and sucked Gu packets dry. We followed The Tour and loved (or loathed) Lance. We loved our bikes so much that we inked them under our skin. We cared about Campy, sneered at Suntour, and resigned ourselves to Shimano. We rode challenges and centuries. But one day the car wouldn’t start, or a friend bailed, or a check bounced, and we found ourselves unexpectedly and only relying upon ourselves. So we got out our bikes and rode again because we had to get to class or the church on time. And maybe we arrived a few minutes earlier than we expected, and in better spirits. Our clothes might have been slightly damp and our hair a bit tussled, but we were there, and we had gotten there through our own muscle power. The inconvenience of self-exertion was more than offset by the satisfaction of self-reliance. Now instead of riding for charity or fun, we ride as a way of life. During fair weather the car never budges from its spot. We ride to work and school and the store without a second thought. Our friends marvel that we ride after dark, or under dark clouds. Sure, we drive when it’s too wet or cold (or not), but we really enjoy getting there by bike. And when we’re on a bike, every day can be an adventure. Wesley Cheney rides with his son Kelvin in tow in a Norfolk, Virginia Critical Mass. Our road bikes grow dusty, while our mountain bikes grow squeakier. Our daily commuting bike is not the lightest and fastest of our lot, but rather the most comfortable and reliable. Sure, it’s fun to take the fixie out for a quick spin, but it isn’t practical for middle-aged joints, day in and day out. Fat tires and fenders make for a softer, cleaner ride. Wide handlebars leave plenty of room for headlights and bells. Instead of buying racks to hold our bikes, we’re buying bicycle racks to hold stuff on our bikes. We want to get home with an extra library book or a gallon of milk, without overpacking a messenger bag. We need a place to haul our bike lock. We are intentional utility cyclists. When we were kids, we laughed at the slow, old guy on his bike as we passed him by. But by now we’ve learned to never underestimate an old guy on a mountain bike; he will get where he wants to go. 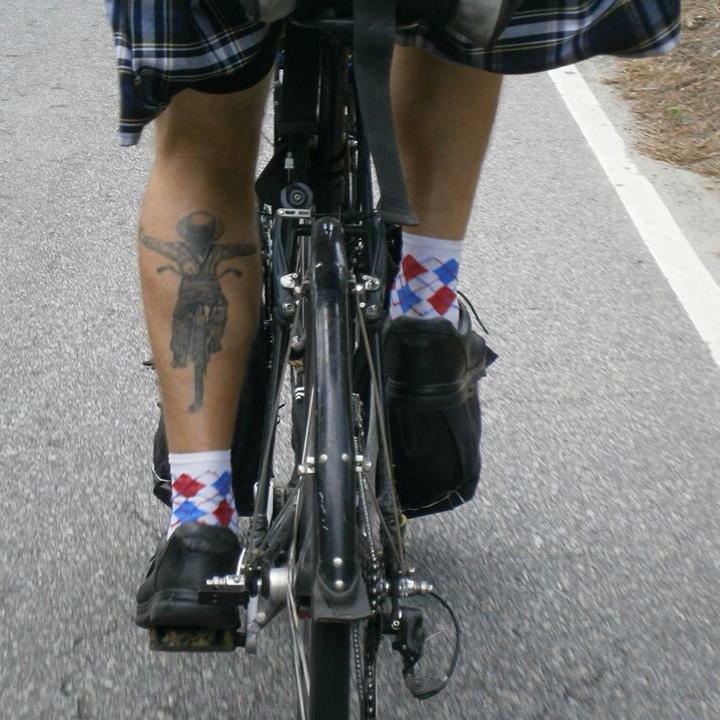 Wesley Cheney rides in a kilt to another day of work as a Utility Cyclist at Carry Norfolk. Wesley Cheney is married to a midwife in Norfolk, Virginia. He writes about bikes and kilts at Foto by Wes, builds bamboo bikes at 757 Makerspace and reposts The Onion on Facebook. Excellent piece. Very much to the heart. Though I took drivers ed in school when I was 15, I never got a license and a car until I was 19. I rode every where. Here I am at 62 and car free for over 5 years now. I had been car light prior to that raising two kids to adulthood via bicycles. Now I’m riding more and more solo and doing everything via human power. Although I’ve never ridden a bicycle competitively, I do remember very well how important my bicycle was back eons ago when I was a pre-teen. I also remember the REAL reason the bicycle faded in importance between junior high school and college … and, technically, it had to do with “uncoolness” only peripherally. What are the nature of the ENORMOUS natural changes to the human body which take place during the teen years? When you answer THAT question the proper approach to the problem becomes ridiculously obvious: figure out a way an American teenage male can get to First Base when he takes his date out on a bicycle. I love this. I wonder if it’s still uncool for teenagers to bike to get around. I suspect the trends are changing, but don’t have any teenagers in my midst to ask. That’s right! We should cycle for us, not really charity or something else. Bike cycling is much healthier. It also save time to take a short way, just like the way to the church as well. We can be active in our lives due to bike cycling.